Sonoma County is one of the largest wine grape producers in California, producing more than even the Napa Valley AVAs. Sonoma County has 12 American Viticulture Areas (AVAs) that vary in soil conditions and climate, making it a perfect area to produce more than 50 grape varieties. It is estimated that 40% ($8 billion) of the county’s contribution to the Gross Domestic Product (GDP) is from the wine industry and related tourism. Sonoma County is recognized worldwide as a producer of some of the finest wines in the industry. Situated at the most northeastern corner of Sonoma County, Alexander Valley is home to more than 40 wineries and over 200 grape growers. Flood plains, benchlands, and foothills rise from the Russian River to the Mayacamas Mountains and growing elevation ranges from 200 to 2,000 feet. The Valley’s diverse microclimates and soil contribute to the production of some of the area’s richest Cabernet Sauvignons, along with flavorful, ripe Chardonnays. Complex and concentrated Zinfandels and Merlots are also produced on Valley’s hillsides. Bennett Valley’s terrain is like no other. Its volcanic and clay soils coupled with a moderately cool climate means the grapes have extended hang time and a longer growing season, perfect for the varietal. Syrah was the first stand-out varietal but the crisp whites are emerging and receiving positive reviews from winemakes, critics, and consumers. After earning its AVA status in 2003, growers in Bennett Valley mostly sold their grapes to other wineries in Sonoma County. Today, 15 small artisan wine labels are under production, with more planned for the future. Carneros (The Rams) is nestled between the borders of Napa and Sonoma Valleys on the North Coast of San Pablo Bay. Carneros earned its AVA status in 1983 and was the first wine region created based on its climate rather than political boundaries. The soil is dense and shallow, with high clay content. Cool and windy conditions, rising hot air, and fog moderate the area’s temperatures, providing unique conditions perfect for the Pinot Noir. Pinots in Carneros are praised for their spicy berry flavors and crisp, tight structure. Carneros is also known for its Chardonnays and sparkling wines. Located at the northeast corner of the Russian River AVA, near the town of Windsor, Chalk Hill is known for its volcanically-derived, chalky white ash soils and higher elevations. Warmer temperatures and harsh soil restrain the vigor of the vines, producing an excellent Chardonnay and Sauvignon Blanc. Grapes are usually harvested in September, roughly a month earlier than the surrounding regions. More than 130 years ago, Dry Creek Valley became one of the first areas in California to start growing grapes and making wine. Winemaking traditions from the past are still alive today in many of the 70+ wineries in the area. The rocky soil and balance of marine and inland climates help produce the concentrated fruit and flavor of Zinfandel. Nearly every winery is family-owned and boasts a diverse selection of wines ranging from Zinfandels to Bordeaux and Mediterranean varietals. There are 18 vineyards located in the Fort Ross-Seaview AVA (the western part of Sonoma County). These vineyards are exposed to longer periods of sunlight and warmer climate than those in the lower elevations. They are generally located on rounded ridges with summits extending over 1,200 feet, consisting of mountainous terrain, canyons, and narrow valleys. This AVA was established in 2012 and its 506 acres lie close to the Pacific Ocean. Green Valley is known as the coolest, foggiest region of the Russian River Valley. As one of the smallest appellations in Sonoma County, it has the most sought-after type of soil in Sonoma County. Sixty percent of Green Valley has Goldridge soil, perfect for Pinot Noir. Over 100 growers and eight key wineries call this AVA “home.” Situated in the southwestern part of the Russian River Valley, Green Valley shares cohesiveness among the wineries as well as the wine. Knights Valley is one of Sonoma County’s original five AVAs. Designated an AVA in 1983, Knights Valley is located between Alexander Valley, Chalk Hill, and Napa Valley, and hugs Mount St. Helena, its most influential feature. Over 30 growers maintain 2,000 acres of vineyards. Knights Valley has the warmest climate in the County and the soil is rocky with huge boulders. The terrain and weather is perfect for growing Bordeaux grape varieties. Cabernet Sauvignon is the most popular wine produced in this AVA but Merlot, Cabernet Franc, Malbec, and Petit Verdot are also popular. Sonoma County consists of 17,663 acres total (1,500 acres of wine grapes) along the western slope of the Mayacamas Mountains. It is a long and narrow region where the elevation ranges from 400 to 2,200 feet. This AVA was established in 2013 with 11 wineries and 40 vineyards. Its rocky hillsides and cool breezes from the coast differentiate it from the Sonoma Valley appellation. Farmers are challenged with finding a balance in this unique land—with its cold fog and winds, and its hot air and increased sun exposure. Bordeaux and Rhône varietals grow well here. Gateway to the Sonoma Coast and northern Marin County wine region, the Petaluma Gap AVA is the country’s newest AVA. Designated in 2017, this region is one of California’s best areas to grow Pinot Noir, Chardonnay, and Syrah grapes. Wind and fog are this area’s trademark and the term “gap” is used to describe the coastal mountain opening that stretches east from the Pacific through the town of Petaluma and moves south to San Pablo Bay. For more than 150 years, the Petaluma Gap has been producing high quality grapes for some of the regions finest wineries. Established in 2011, the Pine Mountain-Clover Peak AVA consists of 230 vineyard acres and an additional 150 acres under development. It lies at a high elevation within the multicounty North Coast viticultural area (overlapping the northernmost parts of Alexander Valley and the Northern Sonoma viticultural areas). Most of the vineyards are relatively small, spanning 5-20 acres of flat or slightly sloping land. Rockpile is located northwest of the town of Healdsburg, spreading west of Lake Sonoma to the Mendocino County border. The red grape varietals grown in this area are known for their intense flavor, concentration, and balance. Much of Rockpile sits at 1,900 feet and is not affected by the area’s fog. The result is rich and ripe grapes. Zinfandel, Petite Sirah, Syrah, Cabernet Sauvignon, Cabernet Franc, Malbec, Petite Verdot, and several heritage Porto varieties are grown in Rockpile. In 1983, Russian River Valley became an AVA and in 2005 the area was expanded by 30,200 acres. The weather is nearly perfect, with a rolling fog from the Pacific Ocean settling in the evening, dropping temperatures up to 40 degrees and retreating in the morning. Grapes can develop full flavor maturity due to the natural air conditioning and extended growing period. Over 150 square miles of vineyards include Chardonnay, Pinot Noir, Zinfandel, Merlot, Cabernet Sauvignon, Sauvignon Blanc, Syrah, Pinot Gris, and Gewurztraminer grapes. 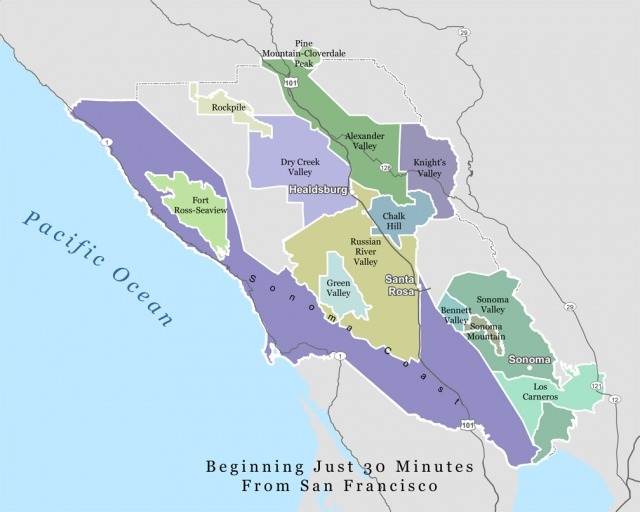 The Sonoma Coast AVA extends 500,000 acres, mostly along the Pacific Ocean coastline. Sonoma Coast is known for its cool climates and high rainfall, relative to other parts of Sonoma County. Most of the vineyards lie above the fog line and stay relatively warm. Pinot Noir, Chardonnay and cool-climate Syrahs are grown in this area. Sonoma Mountain is a lesser-known AVA. It is located above the town of Glen Ellen, on the western edge of Sonoma Valley. Vineyards are planted as high as 2,400 feet above sea level and are subject to direct sunlight during the day and cooled by the mountain air at night. This environment produces vibrantly colored red wines. The soil is mostly volcanic and the free-draining soils help to produce full-bodied Cabernet Sauvignon and Zinfandel. Pinot Noir and Chardonnay are also successfully grown in this area. Author Jack London called Sonoma Mountain home when he moved to a 1,000-acre ranch in 1905. He spent his final days at the Winery Cottage on the Ranch. Fifty-five wineries call Sonoma Valley AVA home. It is approximately eight miles wide and 17 miles long and is bordered by the Sonoma Mountains on the west and the Mayacamas Mountains on the east. Grapes that grow in this AVA enjoy warm days and breezy nights, creating perfect growing conditions. Daily wind slows ripening, prolonging hang time and promoting natural balance in the wines. Chardonnay, Pinot Noir, Cabernet Sauvignon, Merlot, Syrah, and Zinfandel are all grown in this area. Much of Sonoma’s wine history began in the Sonoma Valley AVA. Franciscan monks planted the first vineyards in the valley in 1823 and one of the first successful commercial wineries was founded in 1857. Are you interested in touring one specific region of Sonoma? Check out our Sonoma Wine Tours! Not sure which area of Sonoma to tour? Take a moment to check out Beau Wine Tours’ specific routes, including Sonoma Valley Wine Tours, Russian River Wine Tours, Dry Creek Valley Wine Tours, and Alexander Valley Wine Tours. For the wine connoisseur, our Collector’s Tour may be the perfect match. Enjoy! If you are looking for a wine tour bus and shuttle service, please check out our Sonoma Wine Tour Bus and Luxury Shuttle Service.